Original image by Heinrich Pniok (www.pse-mendelejew.de) licensed under the Creative Commons Attribution-ShareAlike 3.0 (CC-BY-SA-3.0) license. If you ask somebody who remembers a bit of their high school chemistry, “What's the heaviest stable (non-radioactive) element?” they'll usually answer “Lead.” If you pose the same question to a chemist, they'll probably glance at the periodic table on the wall and respond “Bismuth.” Reality is somewhat more complicated, and interesting in its details. But is bismuth actually stable? Naturally occurring bismuth is composed exclusively of the isotope bismuth-209 (209Bi), whose atoms contain 83 protons and 126 neutrons. Now, nuclear structure is quite well understood, and it is possible to calculate from theory that the bismuth-209 nucleus is in a higher energy state than the sum of the energies of a nucleus of thallium-205 and an alpha particle (nucleus of helium-4). In quantum mechanics, whatever is not forbidden by a conservation law must happen eventually, and since alpha decay of bismuth-209 to thallium-205 does not violate conservation of energy or any other law, it has long been expected to occur, but had not been observed to happen. This all changed in 2003, when a group of researchers at the Institut d'Astrophysique Spatiale in Orsay, France reported in a paper in Nature the direct detection of alpha particles resulting from the decay of bismuth-209 using a detector cooled to just two hundredths of a degree above absolute zero (20 mK). 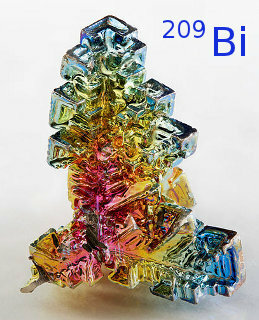 They were able to calculate the half-life of bismuth-209 as 1.9×1019 years. This is a long time. How long? Well, the universe is about 1.38×1010 years old (time from the big bang to the present), so the half-life of bismuth-209 (henceforth I'll write just “bismuth” as this is the only naturally-occurring isotope) is about a billion (109) times the age of the universe. Based upon our understanding of astrophysics and the process of star formation in galaxies, all of the stars in the universe will have burned out in around 1014 years, so you'll have to wait a time a hundred thousand times longer than the era in which stars shone in the universe for half of the bismuth atoms in your bottle of Pepto-Bismol to decay away, which probably substantially postdates the “use before” date on the label. What will the universe be like 1019 years in the future? Well before the last stars burn out at 1014 years, all of the galaxies in the Local Group will have merged into one enormous galaxy. The inexorable acceleration of the expansion of the universe due to dark energy will red-shift even the most energetic radiation from other superclusters of galaxies to wavelengths longer than the size of the observable universe by around 2×1012 years: astronomers in that distant epoch will observe only a single galaxy in an otherwise entirely empty universe. If reports of observations of the universe from our era remain, one wonders whether anybody would believe them. By around 1015 years, planets which orbit the burned-out remains of stars (this being a time ten times longer that that in which stars shone) will be ejected from their orbits by encounters with other stellar remnants or crash into and merge with their own central body due to orbital decay by gravitational radiation. And after an interval ten thousand times longer than this, half the bismuth will still be around. where t½ is the-half life, λ the decay constant, τ the mean lifetime, N the number of particles in the sample, and A the number of decays per unit time (using the same time unit as half-life). Let's assume we have a one gram sample of bismuth: a cube about half a centimetre on a side. The atomic weight of bismuth is around 209, so our one gram sample is 1/209 mole. A mole of any substance is composed of Avogadro's number, 6.022×1023 of constituents. Dividing this by 209, we find our sample contains 2.9×1021 atoms of bismuth. Using the formulæ above, we find that 105 atoms of bismuth in our sample will decay, on average, every year, or around one every three and a half days. But these are alpha decays. Alpha particles have very little penetrating power—a sheet of paper or human skin completely stops them, and bismuth is a heavy element with far greater absorption than those light substances. So, in terms of alpha particles emitted from these rare decays, only those which occur very near the surface will ever be emitted outside the sample: all the rest will be trapped inside. As the overwhelming bulk of a macroscopic sample is in the volume, not on the surface, emitted alpha particles will be correspondingly rare. The French team who measured the decay rate employed the clever strategy of using a detector which was a compound including bismuth and germanium, so that almost every decay would result in a signal from the detector. Getting back to the original question, was the non-professional's guess that lead is the heaviest stable element correct? Well, not so fast…. Naturally occurring lead is composed of four isotopes: lead-204, lead-205, lead-207, and lead-208, with the latter making up more than half. From the same energetic calculation which caused nuclear chemists to suspect that bismuth was slightly radioactive, each of these nuclides should be exothermic to alpha decay with very long half-lives. No such decays have ever been observed experimentally, so only a lower bound on their half-lives, on the order of that of bismuth, can be given. From a theoretical and experimental standpoint thallium (element 81) is believed to be absolutely stable. Still, when it comes to barely radioactive elements, bismuth doesn't take the prize. Barium-130 decays into xenon-130 through the process of double electron capture with a half-life of 0.5–2.7×1021 years, around a hundred times that of bismuth, and tellurium-128 is the all time champion, decaying into xenon-128 by double beta decay with a half-life of 2.2×1024 years. This, the longest experimentally-measured half-life at this writing, is a hundred thousand times longer than that of bismuth, and 160 trillion times the present age of the universe. If you had a one gram sample of pure tellurium-128 (which would be expensive to prepare, since you'd have to perform isotope separation to isolate the 128Te, which makes up about a third of naturally-occurring tellurium), you'd only observe a decay event on average once every 674 years. In wilder realms of speculation, some grand unified theories of particle physics predict that the proton, and by implication, all elements should eventually decay. Experiments have shown that proton decay, if it occurs, must have a half-life in excess of 1033 years, more than 50 trillion times longer than that of bismuth and 72 billion trillion times the present age of the universe. You may wonder which naturally-occurring element has the shortest half-life. That would be francium, element 87, whose longest-lived isotope, francium-223, has a half-life of 22 minutes, decaying either into radium by beta decay or astatine by alpha emission. It was discovered in nature in 1939 (the last radioactive element to be found in nature rather than by synthesis) and is present in trace amounts in uranium and thorium ores. At any given time, it is estimated that only 20–30 grams of francium are present in the Earth's crust. All elements from hydrogen to californium (element 98) have been found in nature, but most of the radioactive elements were first discovered by synthesis and then later detected in trace amounts in natural uranium ore. There is a distinction between “found in nature” and primordial. While the first 98 elements are found in nature, only 84 have atoms present in nature which date from the formation of the solar system. Of these, 80 are stable and four (bismuth, thorium, uranium, and plutonium) are radioactive.